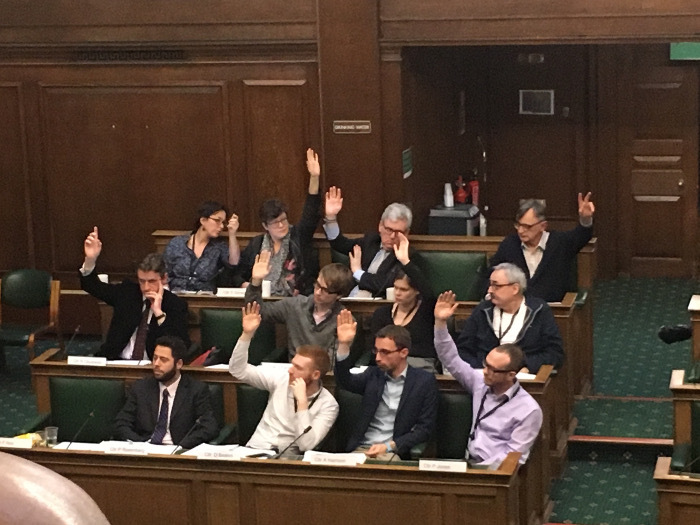 After a lengthy debate in the council chamber on Thursday, the Labour-dominated planning committee voted 11-2 in favour of the proposed development of 156 West End Lane – the Travis Perkins building. The plan is for 164 residential units along with some retail, office and community space. Four of our local councillors sit on the committee: Labour’s Phil Rosenberg and James Yarde from West Hampstead, and Richard Olszewski (Lab) and Flick Rea (LibDem) from Fortune Green. Flick had already stood down from the committee for this decision so that she could speak against it. The other three stated before the meeting that they were going in with “an open mind”. In the end, Phil voted against, the other two in favour. Camden’s planning department and the planning committee clearly have difficult decisions to make. However, when Camden is both judge and jury for applications on its own sites, as in this case, it is always hard to shake the belief that more transparency, more frankness and less spin would help get better outcomes. The full planning officer’s report is here (PDF, 15Mb download). The recommendation was to accept the proposal. The meeting began with statements for and against the development and in a rare development, the three opposing speakers were given two minutes each rather than the five minutes collectively that is usually allowed. Yes, a whole extra minute to fight their corner! First was Joseph Black of does-what-it-says-on-the-tin ‘Stop the Blocks’ campaign. Unfortunately, he ran out of time partly due to a technical problem with his presentation. Their objections covered a wide range of issues, from the height and mass of the buildings and resulting overshadowing, to the segregation of the development, to potential danger from the new access road. 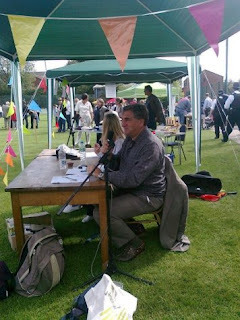 He was followed by Larry Trachtenberg, chair of the Crediton Hill residents association, who talked about the negative impact on the conservation area. Finally there was an employee from Travis Perkins who saw her job in jeopardy. Cllr Flick Rea went next – as a councillor she is exempt from the two minute rule. She has extensive planning experience and knows West Hampstead very well. In a passionate speech she pointed out that there were more than 600 written objections to the plans, which is exceptionally high for any application. She objected to the proposed development’s impact on the conservation area, to its blockiness, to the possible danger from the access road and to the detrimental impact on the village atmosphere of West Hampstead. Finally, she got one of the few laughs of the evening by saying it ‘looks like one of the worst excesses of East Croydon town centre’. Commitee chair, Cllr Heather Johnson tried to cut off but, being made of sterner stuff, Flick managed to get her conclusion in. Jobs: The development will include 1093m2 of employment space (half affordable for start-up units and half normal office space) and 793m2 of retail space. Planning officers argued this would create 108 new jobs overall. Design: Cllr Andrew Marshall raised concerns on the brick colour (and he’s right to worry). Cllr Sue Vincent asked why the building height didn’t fall in line with the sloping land. Density: Cllr Richard Cotton asked how this proposal compared to the London guidelines, and was told that at 788 habitable rooms/hectare it exceeded the 700/ha. guidelines, although this is commonly the case. Overshadowing: Yes, councillors were told, the outdoor games area will be in shadow on summer afternoons, but not enough to breach any guidelines. Vehicle access: The planning and transport officers argued there would be fewer entrances/exits than there are with the current builders’ yard and that it would be safe. Impact on local transport: Cllr Rosenberg asked about the impact of additional users of local transport. The officer said that the effect would be small, and they couldn’t allocate any money directly from the development to help. Community space: The development will have a 63m2 room available to the community, “because there is a shortage in West Hampstead.” As our recent article showed there are nearly 30 other community spaces for hire in the area. The new room could work well but, the costs will have to be covered and these have not been specified. Perhaps the most contentious issue is that of affordable housing. This was discussed, though some councillors seemed to have a shaky grasp of this key but undoubtedly complicated topic. Since April last year, Camden’s strategy has been for so-called “affordable housing” to be affordable-rented and not shared-ownership. Yet this application still includes ‘shared ownership’ units in order to meet the 50% affordable housing target that the council had set itself. How rich must you be to afford shared ownership? We explore this more in this related article. After so much discussion – two hours, your slightly stiff-necked correspondent can confirm – the vote came and went in a matter of seconds. The result was not a surprise. Ten councillors in favour, including Yarde and Olszewski, and two against – Rosenberg and Cotton. Although local Tory activists were noisily opposed to the scheme, the two Conservative councillors on the committee, Cllr Marshall and Cllr Roger Freeman voted to approve the scheme. You can watch the whole glorious event unfold here or in the video embedded at the end of this article. Vote on 156 West End Lane. Cllrs Rosenberg, bottom left, and Cotton (2nd row right) voted against. Chair Heather Johnson (not pictured) voted in favour. Despite the lengthy debate, there was little mention of how to spend the community infrastructure levy (CIL) that the developers will pay in order to help West Hampstead cope with the impact of the development. There is a curious disconnect between the political push to impose yet another another development on West Hampstead, and the lack of any similar push to ensure there is masterplanning and spending of CIL to make day-to-day improvements so these developments can be absorbed successfully. There was also little mention of the NDF, despite this being the first major development to be tested since the neighbourhood plan was approved. And the NDF was behind much of the push to improve the development, though the group still opposed the final version of the plan. Perhaps, the council could turn to the NDF to help with a significant role in masterplanning and that CIL spending. Now we wait for the timetable for demolition and building, and yet more works traffic on West End Lane. How rich must you be to afford “affordable” housing? What have you missed since January 30th?